First choose the file you want to decrypt. You may either use the browse button to set the path to your file (see arrow) or use Drag&Drop to drag a file into the input field from Windows® Explorer. Then fill in the password, that was chosen in the encryption process (see green box). Please note: The password is case-sensitive! 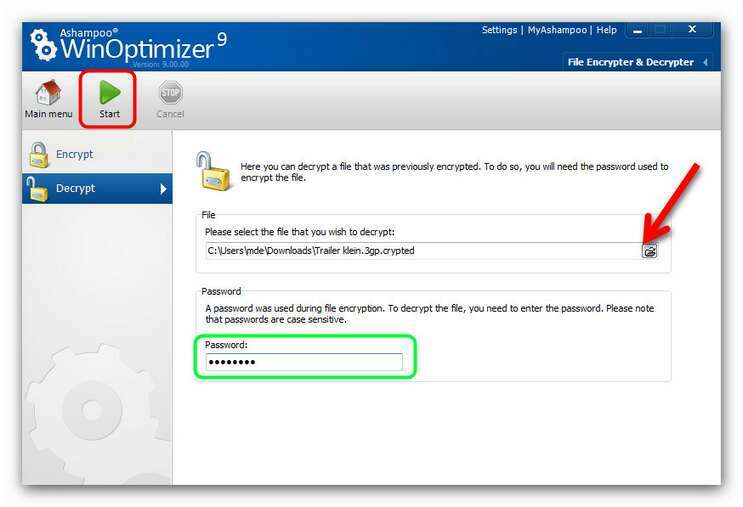 Click Start to begin the decryption process (see red box). Please note that you can only decrypt files that have been encrypted with the Ashampoo File Encrypter & Decrypter!